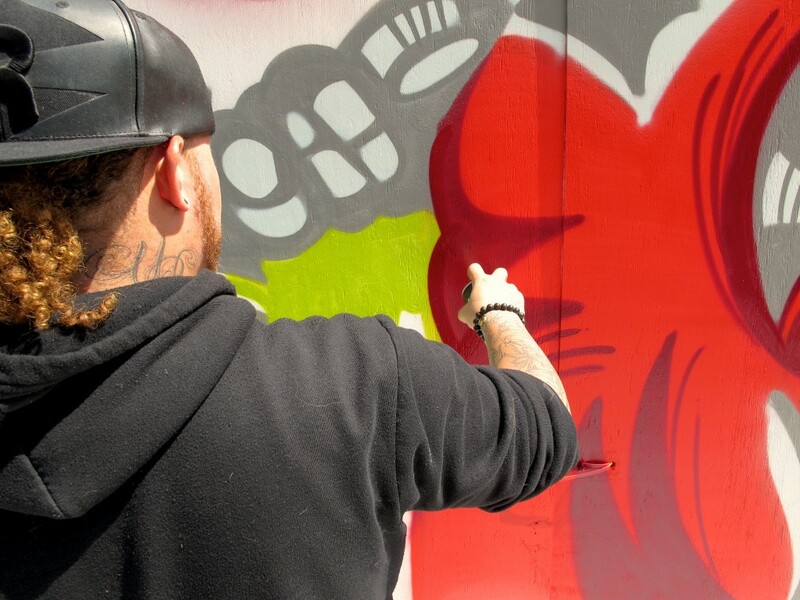 An improbable group of tattoo, hip hop, and graffiti artists wants to change the way people see Israel. Is it just too much? Looming eight feet high and stretching thirty feet from left to right, a makeshift wall stood outside the Hillel House at Rutgers University, its wonky wooden slabs the same chalky texture and bone-white color of the partition between Israel and the West Bank. 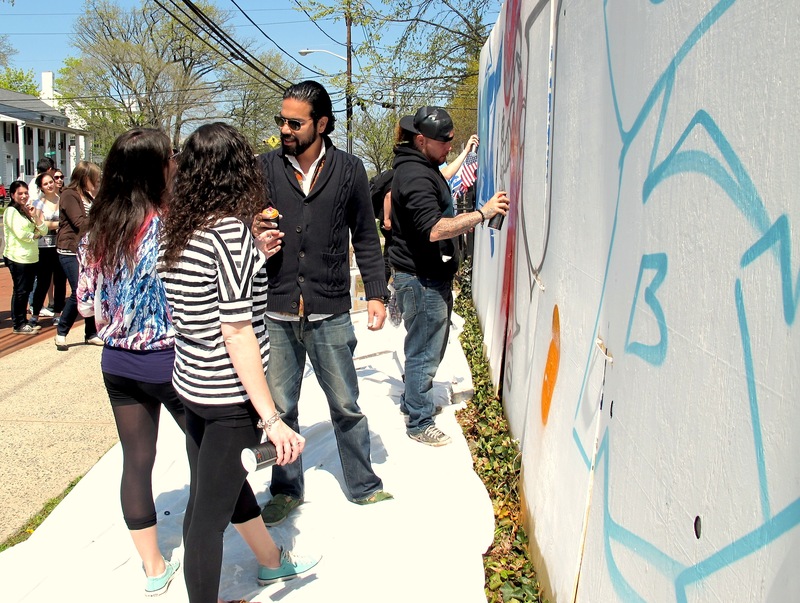 Unlike the separation barrier in the Middle East, this wall in New Jersey divided two entities no more at-odds than a sidewalk full of students and a grassy front lawn covered in picnic blankets and scattered textbooks. But much like the separation barrier, it was about to be covered in graffiti. 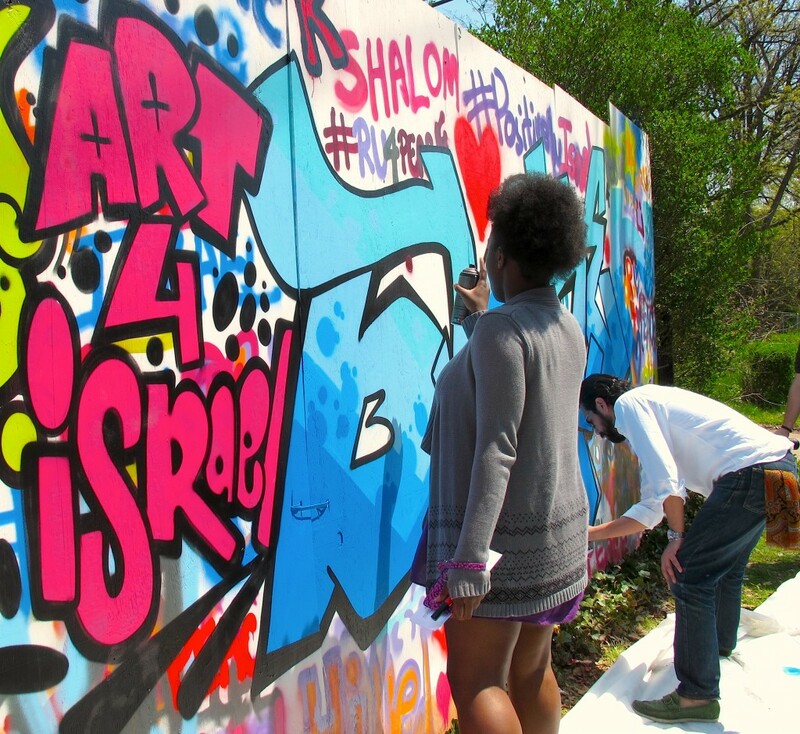 This campus event is just one of the programs in the roster of Artists 4 Israel, a non-profit organization that calls itself “the security fence against cultural terrorism.” Now in its fifth year, the charity aims to promote a positive image of Israel by advocating on campus, painting shelters in conflict zones like Sderot and exhibiting professionally in galleries and at festivals. It’s about getting across a certain ideology: that Israel, a champion of freedom of expression, is misrepresented in international politics. But it’s also about portraying Israel as a thriving, vibrant society in its own right—as more than just a controversy-riddled battlefield buried under decades of verbose politicking and campaign mantras. 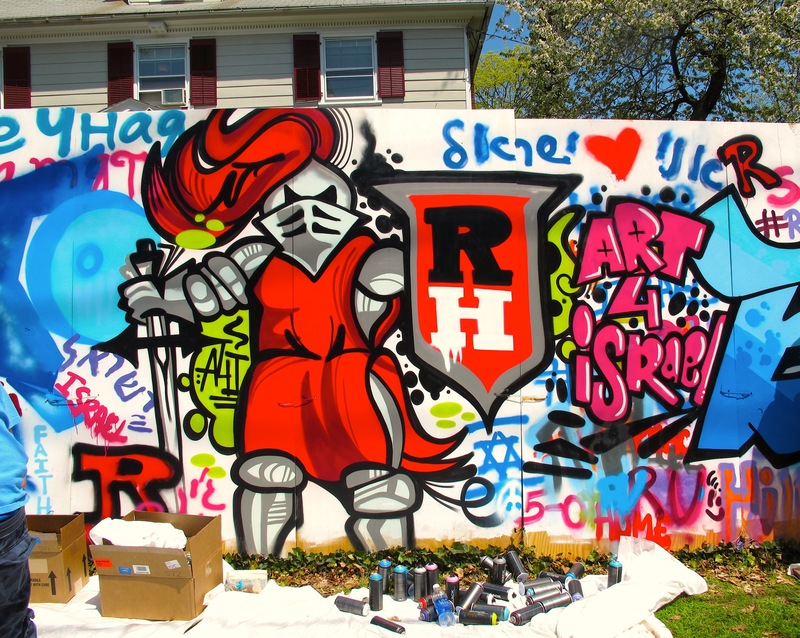 At Rutgers that day, the wall filled up quickly with both the professional designs of the artists and the experimental doodles of passing students, but there were no tomatoes, cell phones or falafel balls in sight. Aside from a few lopsided Stars of David, letters scrawled in Hebrew and scribbled messages of hope—hashtag peace—there was no ideological, political, or educational content to the graffiti. And that’s kind of the point. Artists 4 Israel doesn’t preach or indoctrinate—at least not directly. It operates on a theory of “show, don’t tell”: reflect the good side of Israel, don’t just talk about it. It’s the Cadillac mentality, says Dershowitz: successful advertising campaigns from the 1920s onwards elevated Cadillac to become synonymous with quality, without discussion of the technical specifications of what makes a Cadillac car unique. “It’s the Cadillac of such-and-such,” people would say, boosting the car company’s public image even when talking about other products or ideas. Using art to talk about Israel in a real way is merely the action of holding up a mirror and pointing it east. Israel has an internationally recognized and respected arts scene, led by figures such as the architect Ron Arad and the writer Amos Oz. The country encourages its growing arts culture by offering governmental grants and supporting specialist schools, and Israel has more museums per capita than any other country in the world. There are many factors at play here. As a socially progressive democracy that embraces women, racial multiculture and the LGBT community, Israel lends itself to the formation of new ideas, expressed in original ways. The modern State of Israel is a young child, sitting cross-legged on the floor of her parents’ studio in the shadow of their art that lines the walls; she has within her reach crayons of all colors. Still exploring new ways of holding the paintbrush or the violin bow, she is guided by a rich heritage of artistic expression and vivid storytelling. Then there’s Israel’s proverbial open-door policy that has created a hodgepodge of cultural identities and belief systems—from Arab to Russian to American—which, when left to ferment, fosters creativity and has spawned such fusion art as the world-music group The Idan Raichel Project. Israel is a country with a unique DNA, and that shines through its skin. And all this, Dershowitz points out, from a country where almost everyone between the ages of around 18 to 21 is prevented from doing art and exercising their individuality and creativity because of their enlistment in the Israel Defense Forces. Yet the boycott of Israeli art is the story that persists, and so the use of the arts to defend and promote pro-Israel ideology is particularly apt. This conflict, more so than others of its sort, is truly a clash of cultures: it represents the dichotomies of censorship and expression, of suppression and freedom. In this equation, Israel is the art its enemies seek to quash. 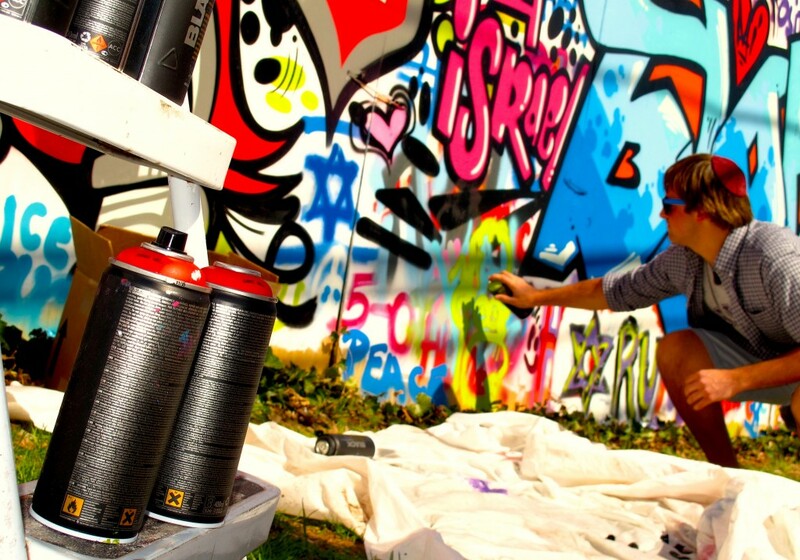 It’s noteworthy, too, that Artist 4 Israel’s medium of choice—although it also embraces fine art, life drawing and theater—is urban art: graffiti, tattoos and hip hop. “Graffiti is cutting edge, it’s raw, it’s different—it’s even borderline rebellious,” says Robinson. These subculture arts are becoming more prominent in mainstream culture, bringing with them a younger, earthier generation. If canvas watercolors and German operas can be accused of elitism and exclusivity, then graffiti and hip hop are accessible and inclusive: it’s the art of the people. It’s also a particular area of the arts where a disparity in political discourse needs to be addressed. If canvas watercolors and German operas can be accused of elitism and exclusivity, then graffiti and hip hop are accessible and inclusive: it’s the art of the people. 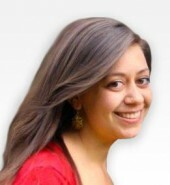 But it’s also an area where the anti-Israel voice has been especially prominent. The visual urban arts scene is no different. British graffiti artist Banksy has painted several murals—including a dove wearing a bulletproof vest and a soldier checking the identity papers of a donkey—on the Palestinian side of the separation barrier to draw attention to the poverty and poor quality of life experienced on the other side of the wall. “That gets into people’s subconscious,” says Dershowitz. Artists 4 Israel “counters this misconception in an artistic way”; in a new twist on fighting fire with fire, the organization tries to fight cool with cool. There’s one major problem with using art to talk about the Middle East, however: art may be the least untrue of all lies—but it is still a lie. It’s an artist’s way of illustratively depicting his personal worldview in an obscure way, disguising his meaning behind brush strokes and blended colors. Thus, what Artists 4 Israel is trying to do inadvertently sums up the core problem with the conflict in the Middle East: we’re all looking at the same canvas and seeing different things. The charity’s intense focus is one of the main drawbacks of the organization: its artists paint solely in proverbial blue and white. The conversation is one-sided and Israel-oriented. Dershowitz, the former Wall Street man who runs Artists 4 Israel, is unabashedly right wing: he has the history of Israel tattooed on his right arm, with a prominent place given to the militant leader Zeev Jabotinsky. He gestures quotation marks in the air when he says “Palestinian,” preferring to use the term “displaced Jordanian,” and idolizes the settler lifestyle. Some of the artists, on the other hand, know—or seem to care—little about Israel. They get involved for the art, or because they’re friends with Dershowitz. It’s an odd concoction. Mike “2ESAE” Baca, a Puerto Rican artist from New York, regularly participates in on-campus events with Artists 4 Israel and has been on one of the painting trips to Israel, where the organization “beautifies” the country from bomb shelters in Sderot to low-income neighborhoods in Tel Aviv to schools for at-risk girls. Hebrew slang words such as “sababa,” meaning cool—as well as some less repeatable phrases—tumble out of Baca’s lips as he chats. He’s not particularly political, and doesn’t side with Israel or Palestine. “I’ll paint for peace,” he says—and he’s grown partial to Israeli sufganiyot (doughnuts). The images Baca sprays with a skilled and steady hand onto walls in Israel aren’t explicitly political, but they’re not entirely devoid of meaning. He remembers painting the cartoon characters Tom and Jerry on the walls of a pre-school. They’re familiar illustrations that excited the children, but they’re also emblematic of the conflict: two classic enemies, cat and mouse, who live in the same house, often resort to extreme levels of violence but also, every now and then, come together in an encouraging show of unity. On both sides of the conflict, “everyone thinks they’re the cat”—namely, Tom, who usually loses to Jerry’s greater speed and cunning—“not the rat,” Baca says. “Graffiti’s one of the strongest forms of communication,” he says. To be effective, however, doesn’t the graffiti have to say something? Artists 4 Israel’s spray-painted wall was more akin to a crayon drawing brought proudly home from grade school: it’s charming enough to be taped onto the fridge door, but you notice that the sketched people are mere stick figures, not fully-fleshed characters. Rushmore accused Artists 4 Israel of being propagandist. But so what? There’s no doubt that Artists 4 Israel flirts with provocation; Dershowitz admits that the organization “treads a fine line between art and propaganda.” He evokes Picasso’s Guernica, for example—a painting commissioned by the Spanish Republican government that is attributed with opening the world’s eyes to the Spanish Civil War and has since become an anti-war symbol—and Shepard Fairey’s Hope poster from Obama’s first presidential campaign. The writers who have come up since 1930 have been living in a world in which not only one’s life but one’s whole scheme of values is constantly menaced. In such circumstances detachment is not possible. You cannot take a purely aesthetic interest in a disease you are dying from; you cannot feel dispassionately about a man who is about to cut your throat. Art is not truth: it depicts a subjective, sometimes warped, worldview. As long as the beholder is cognizant of this, let the artists paint on. In December, Artists 4 Israel headed to Miami for Art Basel, the prestigious contemporary art show. Rubbing paint-splattered shoulders with the likes of art mogul Larry Gagosian, designer Diane von Furstenberg, musician Kanye West and actress Demi Moore, the organization’s artists put on three events. In one location they showcased the work of Israeli fine-artists, in conjunction with the Israeli Consulate, to convey the strength of Israel’s art scene. In another area, two DJs spun tracks on a stage in the middle of an outdoor yard as 50 artists—mostly non-Jewish, with no personal affiliation to the Middle East—painted large murals in support of Israel. Each artist drew whatever they wanted, in their own style, under the express statement that they believe in Israel’s right to exist in peace and security. 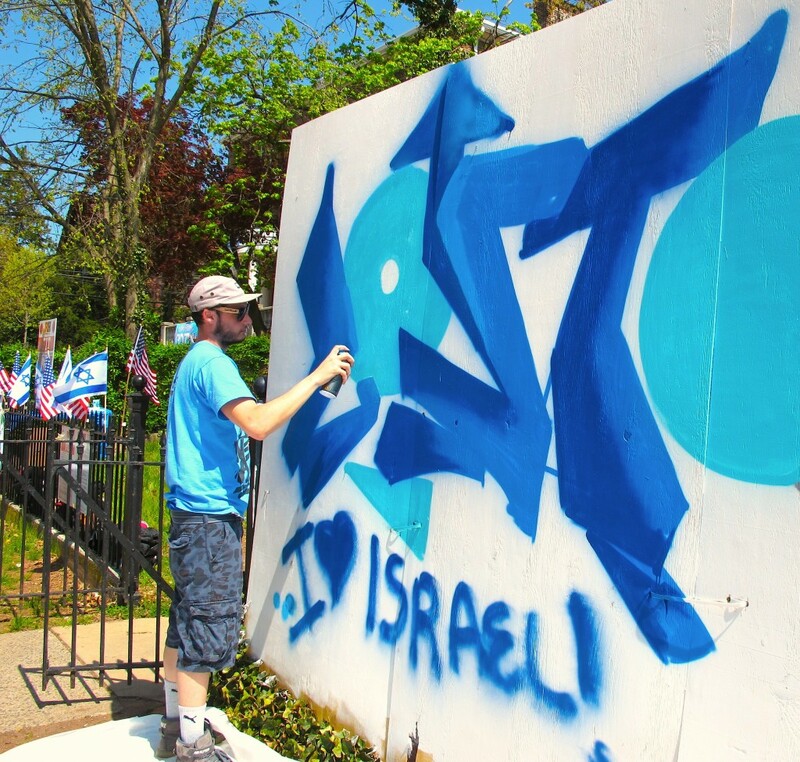 Some murals had no Israel-related content at all, some artists just used Artist 4 Israel’s logo, and some even spelled Israel wrong—“Isreal.” But the point was not to depict an informative pro-Israel message or to spread facts about the conflict; it was to show that the urban arts scene does indeed support Israel. The third of Artists 4 Israel’s exhibitions at Art Basel was perhaps the most memorable for the thousands of people who experienced it: the bomb shelter installation, an immersive multi-media experience that has also served stints in various New York locations, from Washington Square Park to the streets of the Flatiron District. Large letters stenciled on the drab, grey exterior of the portable cabin ask the participant, “What could you do in 15 seconds?,” referring to the short amount of time residents of certain areas in Southern Israel have to find shelter after hearing the first blast of the tzeva adom—the “color red,” or warning siren—before the first rocket strikes. The exhibit, which allowed people to spend time inside the claustrophobic mock shelter, simulated the siren ominously counting down the 15 seconds and showed footage of residents of Sderot running towards shelters. The bomb shelter is art, because it’s living; it’s not a museum, because that’s where we showcase history. The idea is to humanize the conflict—to allow people going about their Western lives to feel what Israelis in certain areas experience on a near-daily basis. “Art’s a super crazy weapon,” says the graffiti artist Baca. If that’s the case, then these artists are soldiers, with their index fingers poised over aerosol nozzles instead of gun triggers. They might be shooting rubber bullets when it comes to educating the masses about Israel—not that rubber bullets don’t leave a bruise—but it’s in the pro-Israel advocacy community that Artists 4 Israel could really make a difference. If old advocacy is that scene from Monty Python’s Life of Brian, where a group of grumpy-looking Jews in togas recline on the steps of the Colosseum and curse at Brian for getting their organization’s name confused—“The Judean People’s Front? We’re the People’s Front of Judea! … The only people we hate more than the Romans are the Judean People’s Front!”—then new advocacy is that scene where Brian slathers red paint over a large stone wall, telling the Romans to go home in a bold and visual display of his political beliefs. Brian suffers a few teething problems; he fumbles for the infinitive and stumbles over his verb conjugations, but he gets it right in the end. And he writes out his message all over the wall, 100 times, in thick scarlet paint. It may be that the only Latin content of Artists 4 Israel is its Puerto Rican, Brazilian and Chilean artists who volunteer with the charity. But declensions aside, this is how the organization envisions spreading its pro-Israel ideology. Dershowitz calls it being “post-message.” Even if the big red letters don’t say very much, at least people are stopping to look at them. 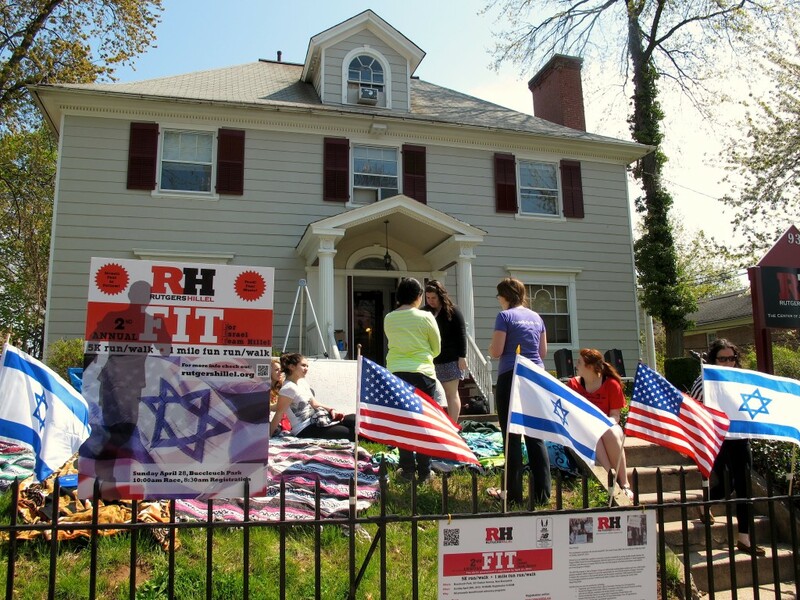 “I’m sad to say, facts are irrelevant,” said Tzvi Raviv, the director of Israel engagement at Rutgers’ Hillel House, as he sat on paint-stained grass. It is, at the end of the day, immaterial that Israel has, per capita, the highest number of startup companies in the world, or that it is the only liberal democracy in the Middle East. Advocacy is not about always having the answer—it’s about asking the right questions. And that’s where art—even if it’s not truthful and even if it’s propagandist—comes in. As Napoleon famously said, a picture is worth a thousand words. There are not just two sides to every coin: there’s the head and the tail, and then there’s the rim, that bit on the periphery that jags off in all directions, facing away from the center. It’s the same with Middle East advocacy: there’s the pro-Israel side, the anti-Israel side, and those who belong in some way to the coin but are disinterested and uninvolved. Artists 4 Israel tries to include these people, whom traditional advocacy has failed to enthuse. It’s an idea not foreign to Judaism: take the four sons at the Seder Night, for example. One is wise, one is wicked, one is simple—and we have answers for all of them. But Artists 4 Israel speak to the fourth son, too: the one who does not even know how to ask. At the end of a busy and successful day at Rutgers, four artists piled into a black Volvo and headed back to New York. In some way, they felt that they had left their mark on the students of the university, just as they have left their mark all over the walls of Israel. And maybe Artists 4 Israel can do the same with the pro-Israel lobby. It could use a splash of color.